When? Before booking a lesson/session with your teacher/conversation partner. Why? Lingworld works on a Top-up account basis (like Skype for example). You need to add money to your account in order to pay your teacher/conversation partner for lessons/conversations. When you pay, the funds get transferred to your teacher/conversation partner account. LingWorld.com uses PayPal to transfer money between you and your teachers. This way, your financial account information is Not communicated to LingWorld.com. PayPal is the most popular funds transfer service on the Web, and is an extremely secure way to transfer money to your account. 1. Click Top-up Account in the My Account section of the navigation pane, or click Top up Account at the top of the webpage. The Top up Account screen opens. The Top up Account screen notes that LingWorld.com accepts Master Card, Visa, American Express and Discover via the PayPal system. 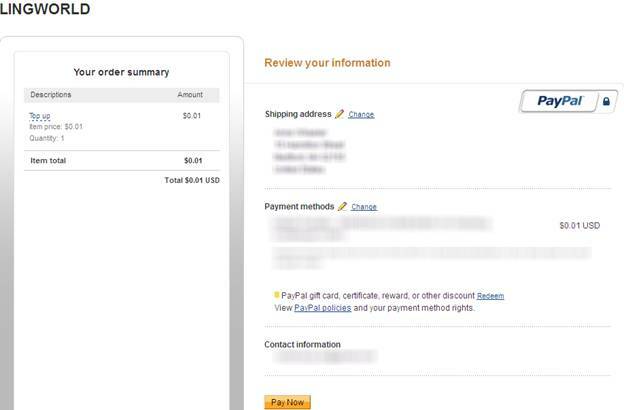 LingWorld.com uses PayPal to process all financial transactions. 2. Type the amount you would like to add to your account in the Enter top up amount field, in US dollars. 3. Click the Top up button. The PayPal website opens. 4. Type your email address into the Email field. 5. 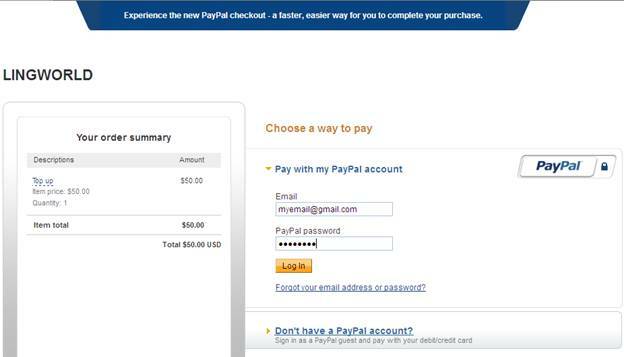 Type your PayPal password into the PayPal password field. 7. Review your information on the next screen, and click the Pay Now button. Your account is topped up and shows the credit next to Balance at the top of the screen.